Welcome to Clay-King's Pottery Studio Classes and Workshops. Each class and workshop will be taught by local and visiting artists, as well as members of Clay-King's staff. Learn the basics of ceramics from hand building, wheel throwing, sculptural/functional pottery, and more. To sign up, give us a call at 888-838-3625 or email us at april@clay-king.com. A night of fun on the potters wheel! Clay, tools, coffee and snacks will be provided; please feel welcome to bring along your own beer or wine to enjoy as well. This class is reserved for members and staff of the Spartanburg Dialysis Clinic. 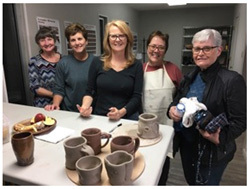 This class is designed for adults interested in learning about the potters wheel or expanding their knowledge with clay. Tools will be available for student use, but clay must be purchased separately. Some glazes are available for class use, and ﬁring is included in the class fee. The retail portion of Clay King will be open during class time. Relaxed studio time with Clay-King's expert staff on hand! This open studio atmosphere takes place on the first and third Saturday of each month. Our creative staff will give a demonstration on a special technique at 10am, followed by your free time to create! The studio fee includes instruction and guidance through the technique presented, enough clay to create our demo technique, basic tools, firing, selection of studio glazes and glaze firing. Not only is this a time to learn something new, but also an opportunity to have our assistance on a project you have be hoping to work on! . Majolica is an ancient type of pottery in which an earthenware clay body (usually a red earthenware) is covered with an opaque white glaze then painted with stains or glazes and low fired. During this two day workshop, students will create a simple, hand-built pottery piece, practice decorative techniques and apply their own decoration to the bisque fired work. The first week we will be making pottery to glaze the following week. The second week we will be glazing and painting. If you choose to only register for the second Saturday, you will be provided with bisqueware to glaze and decorate. Come create a unique slab-built mug for sharing as a gift or treating yourself! This workshop is open to all levels. Each student will create a mug and Clay-King will bisque fire for students to return and glaze. Clay, tools, firings and a selection of glazes included! Exploration for the beginner and an opportunity to learn more for the more advanced student! Students will try their hands at hand building and wheel throwing techniques while creating pieces they can use at home! Includes clay, tools, studio glazes and firing. Pre-registration required. Ages 6+. See studio policies regarding cancellation. Take a break from the heat of summer and learn how to create wonderful works of art on the pottery wheel! Students will create a variety of wheel thrown pieces and learn about the firing process before glazing each item. Pre-registration required. Ages 7+. See studio policies regarding cancellation.